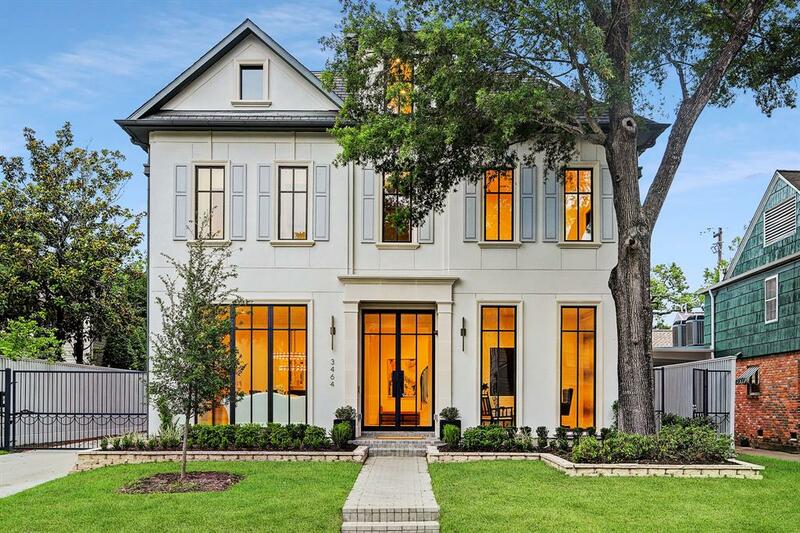 Stylish and stately new construction. Desirable location in the St. John’s quadrant of River Oaks. Impressive, wide entry. Flowing, open floor-plan. Cantera iron and glass doors/windows that beautifully blend the indoors with outdoors. Restoration Hardware fixtures. 11' foot ceilings, white oak floors, abundant natural light. Grand kitchen with quartz, metal/brass range, glass custom cabinetry, quartz waterfall island, top of the line built-in appliances, gas range. Wet bar with 7’ wine vault, wine storage, and glass/stainless chiller. All bedrooms have private bathrooms. Third floor with large game room and bedroom. Elevator installed. Tranquil master at back, sitting area, boutique sized closet. Separate guest quarters (530 sq.ft.). Outdoor space with second floor balcony, covered patio, summer kitchen (buyer selects). Wired for surround, speakers included, CAT 5 wiring/RG6 cable. Walk to Pumpkin Park - grounds with benches, tennis, sports field and trails. You will love this home.